Marie Springsteen (R) and the emcee from WINK TV. On Saturday, January 14, 2017, from 8:00 a.m. to noon, the 4 Words Foundation and 21st Century C.A.R.E. held the Second Annual Facial Hair for Cancer Awareness 5K/10K Walk Run at Tara Woods. 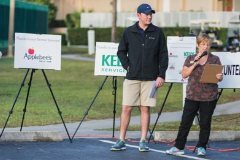 Proceeds went toward raising cancer awareness and education as well as providing financial assistance to patients in the Southwest Florida area. This year’s goal of $5,000 was exceeded! Congratulations to Marie Springsteen, who spearheaded the effort. Tara Woods is proud to have been a part of the event. 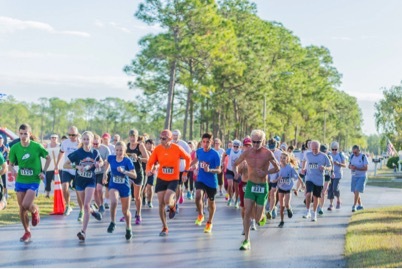 Runners and walkers from the surrounding area as well as Tara Woods residents participated in the event, which was open to the public and to all age groups. 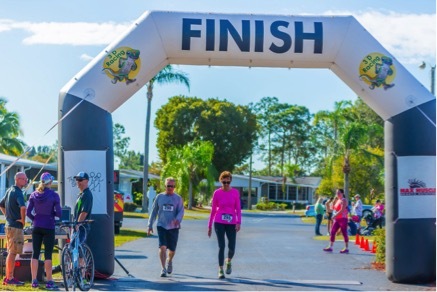 Doug and Debbie Objartel cross the finish line. In conjunction with the race, the popular Wall of NO SHAVE Contest returned. Men and women entered their Best/Sexiest/Most Disturbing facial hair (real or fake). They were judged by $1 donation votes. Congratulations to our resident winners. All Tara Woods winners listed below participated in the 5K. Marie would like to thank all the participants as well as the volunteers and sponsors for a fun and worthwhile event. Click the thumbnail image above to see the full-size photo. Photos courtesy of Sam Jokich.